Castle Comfort Stairlifts offers top brand stairlifts, keen prices and fast installs for all those seeking stairlifts in Glenrothes, Fife. And all work comes with our no-quibble guarantees and famous customer service satisfaction. Glenrothes is an unusual town not least because of its short history. Glenrothes is a new town conceived and built in the 1940s initially as a mining community. The new Rothes Colliery would have its own town. That is until the new colliery didn’t take off. It was supposed to be the star colliery with all mod cons but the National Coal Board came across water, lots of it. Local miners had always predicted that would be the case, but the experts went ahead with planning to mine 10 sq miles in the area with 2 deep shafts. They got one part way down before they hit 1,000 of fast-flowing gallons of water. To shore up the walls of the mine they would need unbelievably thick concrete, so the decision was taken to pump water out. About 1,100 men mined what was accessible, less than half of predicted 2,500. The mine never produced the amount of coal that was estimated. By 1962 the mine was closed. Castle Comfort Stairlifts have been supplying stairlifts all over the UK for 15 years now and we haven’t missed Glenrothes! If getting up and down your stairs feels as formidable as descending a mine shaft, talk to us so that we can reassure you how safe one of our stairlifts is. Around 195 retired inhabitants of Glenrothes already own a stairlift and have put that problem behind them. 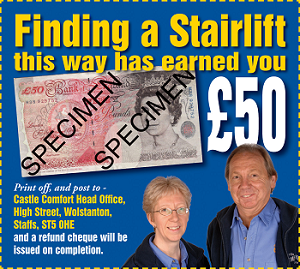 You can see our scrolling counter of all those who own a stairlift here. How has a stairlift helped them? Well it helps to return your independence whilst at the same time increasing the safety of that journey up and down the stairs. We supply stairlifts from all UK manufacturers including some made especially for us and also reconditioned ones. So there’s a good choice and something that will suit you and your pockets. Take a look at our prices and give us a call if we can help at all on 0131 242 0046 . Glenrothes was built on land that had belonged to the Earl of Rothes. Glen was added to the name so that it wouldn’t be confused with the town Rothes in Moray and also to acknowledge that is was built in a river valley. The land had been mainly agricultural with a few small hamlets in the area such as Cadham and Woodside. When the colliery closed, the town developed as home of Scotland’s Silicon Glen between 1961 - 2000. This is where a number of electrical and technical companies developed their businesses. The family home of the Balfours was swallowed up in the development of the new town. The house became council offices although they were sold off and the house is now run as a hotel. The extensive parklands are now a golf course. The house is a Category A Listed building. For a number of years Glenrothes employed a city artist and evidence of their work and work of their assistants can be seen around the town. Often the modern sculpture will make you smile, such as the thirsty hippos made in concrete by Stanley Bonnars. They appear in various places around the town. The Giant Irises were produced by one of the long-serving members of the artists’ group, Malcolm Robertson. They were the entry for the Glasgow Garden Exhibition in 1988 and won the John Brown Clydebank award for the ‘Most Original and Amusing Artefact’. Today they are planted in Leslie roundabout. The Dream also by Malcolm Robertson is near Church Street in the town centre. As Glenrothes is such a new town, there aren’t many historical connections apart from the Balfour family and the Earls of Rothes. The 22nd Earl is James Malcolm David Leslie. Their title goes back to the mid 15th century. Later inhabitants with a claim to Glenrothes and fame seem to be lead by Dougray Scott. Actor Dougray has a very successful TV and film career. He appeared as the lead in Soldier, Soldier when it first aired on UK TV, the films Twin Town, Mission Impossible: II (hand picked by Tom Cruise), Enigma, Ripley’s Game and The Day of the Triffids. He appeared in 18 episodes of successful US TV series Desperate Housewives and he will appear in Dr Who next year. 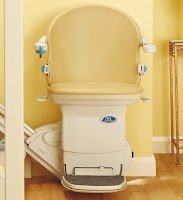 · That a stairlift from Castle Comfort Stairlifts could improve your life no end?